Monday, March 24, 2014, the University of the Philippines (UP) Diliman approved the proposal to shift the start of the academic calendar to August from June starting school year 2014-2015. The announcement were posted on UP Diliman Facebook page stating that the UP Diliman University Council that composed 300 professors (assistant professor to full professors) voted (284-164 decided) to support the shift in the academic calendar of UP Diliman from June to August 2014. The announcement furthermore says that Chancellor Michael Tan will now bring this sentiment to the next UP Board of Regents meeting on March 28 for approval. With this development, all UP constituent units will start the school year in August 2014. 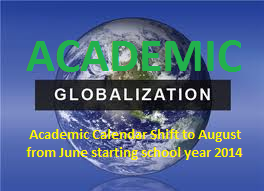 The reason why those universities are urged to changed the academic calendar from June to August is mainly to synchronize it with other Asean universities for Internationalization to meet University’s global standing. University of Sto. Tomas and the Ateneo de Manila University also approved this shift of school calendar to August. This significant changes of academic calendar may soon be implemented all throughout all universities in Philippines, lets see whose next to follow this innovations in academic global synchronization. Are you agreed with this academic changes? Speak up your mind by posting comment below, thanks.